The Redbet casino is easily one of the top UK friendly online casinos out there. The site offers a wide variety of games, as well as a full sportsbook. 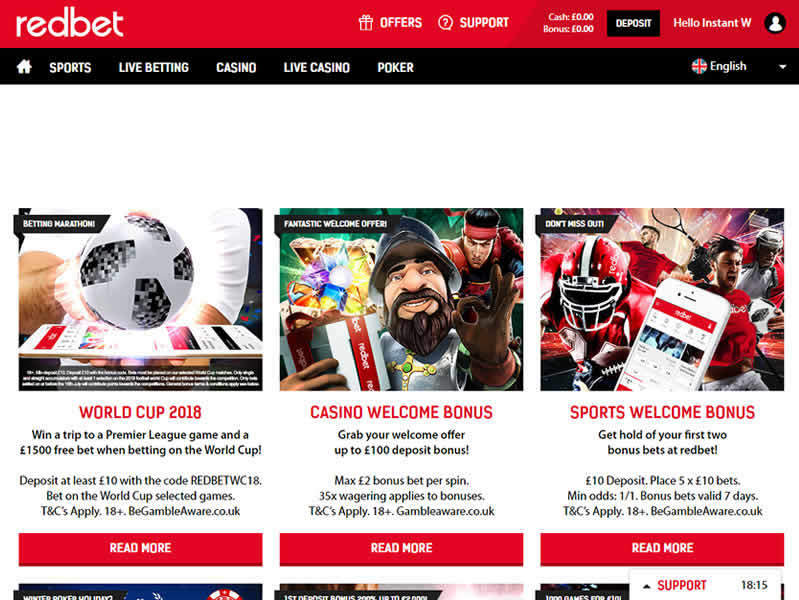 Whether you’re into slots, live table games, video poker, or just want to place a bet on your favourite teams, Redbet most certainly has you covered. 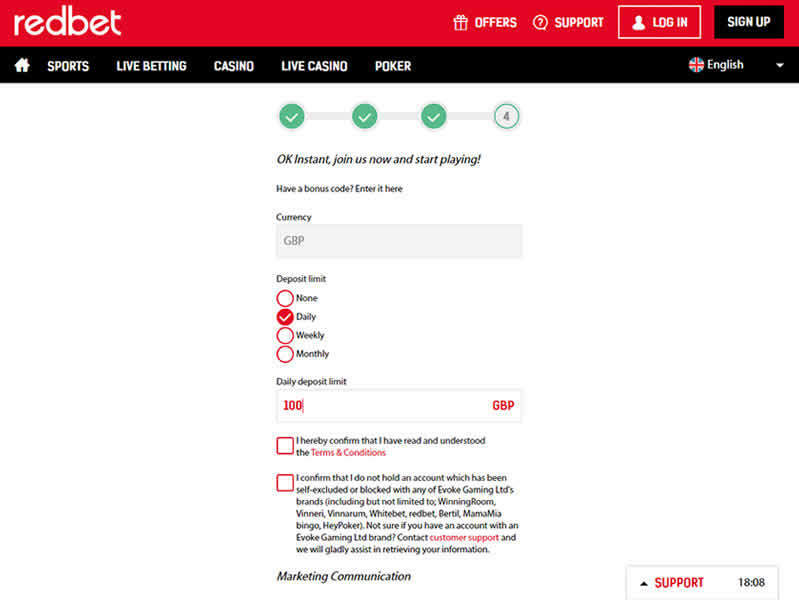 Aside from a full stable of all of the latest digital casino games, poker, and sports betting options, Redbet also goes out of their way to make sure all players are fully satisfied and fully protected. They provide support via telephone, email, or live chat. The operation is licensed and certified by several gaming regulatory bodies and security firms, and the company works with some of the most recognised and revered providers of software, games, and payment processing. As mentioned previously, this gambling venue is available to UK and other European players, but doesn’t accept USA or Australian gamblers. If you are located there, don’t worry! You can also find the best Australian online casinos and USA casinos with fast payouts by navigating our website. Redbet Casino offers a full array of financial options for depositing and withdrawing funds to and from the site. In most cases, payments in or out are very fast, happening within a few minutes of approval. At the time of writing, you can deposit or withdraw money from Redbet using any of the following options: e-wallets Neteller, Skrill, and Paysafecard, direct bank e-payments, standard banking transfers, and Visa, Visa Electro, and Mastercard credit and debit cards. Redbet accepts the following currencies: EUR, GBP, CHF, USD, SEK, NOK. While we found several complaints about withdrawal delays, we could also verify that these claims were easily solved after verifying the casino account. So we strongly recommend to send the requested documents within 72 hours to avoid account suspension or issues with withdrawals. Remember that Redbet casino follows strict standards coming from the UKGC, so if you decide to play here you will have to comply with what is requested. Redbet is most certainly not short on bonuses and promotions for all of their players. There are a few different welcome bonuses, as well as regular promotions that pop up from time to time. As a player at Redbet, you’re always going to have the chance to scoop up some bonus winnings. Here’s a quick rundown of what they’re currently offering. Of course, be sure to check Redbet’s bonus terms and conditions. The casino welcome bonus is very straightforward and easy to take advantage of. All you need to do is make a deposit of at least £20 and get a 100% bonus of up to £100. If sports betting is your thing, there’s a two-round welcome bonus waiting for you. Deposit a minimum of £10 and make five bets of at least £10 each and you’ll be credited with a free £10 bet when your initial bets are settled. Round two works exactly the same. Make another deposit of £10 or more, place five bets of £10 or more, and you’ll be credited with another £10 bet for free. Little Fish Welcome Bonus: Deposit £10 and get a bonus of £20. For every £1.00 you spend on either tournament fees or rake, £.50 will be added back to your balance. Big Fish Welcome Bonus: Deposit any amount between £11 and £200 and receive a 200% bonus with a 25% release rate. Cardboard Box Welcome Bonus: Deposit £201 or more to get a deposit bonus of up to £2000 with a 20% release rate. Redbet Casino is a fully UK friendly online casino licensed by the UK gambling commission as well as the Malta Gaming Authority. UK players can rest easy knowing that both the casino and the games they offer are being checked regularly for fairness and security. Signing up to play at Redbet is quick and easy. The process will literally take less than 30 seconds. Your name, email, and address will get you in the door to look around. You will, of course, need to make a deposit to play any of the games though. Everything is very well organised and easy to navigate. The main menu will take you to the sportsbook, live betting, casino, live casino, or poker. When you select an option, a submenu will appear to let you refine your choices. The menu is always visible so you never have to scroll or search to find your way around. Everything works right in your browser with no download needed. The poker section does, however, offer a poker client download that will give you more features. The slots section of the site is exceptionally well put together. Players can, of course, just browse through titles sorting by age or name, but the search functions are really something special. It’s possible to search by name, by game provider, and even by features such as jackpots, special wilds, free spins, autospin, pay lines, volatility and more. If you like particular features in your slots but want to find something you haven’t played before, Redbet’s search functions will surely make your day. Players will find a full selection of wagering options, from a sportsbook that includes live betting down to the latest and greatest video slots. Sports betting is available around the clock and players can bet on games and activities all over the world. There are also approximately 40 live table games where players can play the likes of Blackjack, Poker, Baccarat, Roulette, and more. The site doesn’t provide a full count of all of their available slot machines, but a rough estimate based on a quick count comes out to over 700 slot machines currently available. A quick browse through their offering shows that they are adding new slots as they come out, so there’s no chance of getting bored with the same old games. They’re also presenting slots from the industry’s top slot platforms and designers. You’ll find games from companies like NetEnt, Microgaming, Evolution Gaming, NYX, Play’n Go, and more. As you can imagine, Redbet runs smoothly in any mobile device, because it’s optimized for Android and Apple devices, call it smartphones or tablets. The Redbet sportsbook boasts over 60,000 betting options available every day. Players can bet on a full range of sports and leagues around the world. You’ll find everything from football, baseball and tennis to e-sports, futsal, and Gaelic hurling. The layout is easy to navigate. Just pick your favourite sport(s) and you’ll be presented with all the options you need to decide how you want to bet. Players can very conveniently switch odds display between decimal, fraction, and American. You can also, of course, see all of your open bets as well as your betting history. The live betting section will give you a brilliant overview of everything going on at the moment with live odds. Choose your favourite sport along the top menu and you’ll see every game currently underway and available for betting, along with the current odds. It really couldn’t be any easier to find what you want and place your bets. If you’re looking for a safe place to deposit and wager, you can’t do better than Redbet Casino. They’ve just got everything covered. The operation is fully licensed by two of the most trusted gaming authorities in the world. They work with the top online gaming providers to deliver a vast selection of games. There’s a full-service sportsbook at your fingertips, and they make both depositing and withdrawing funds fast and easy. What more could you ask for? It’s difficult to find anything negative to comment on. 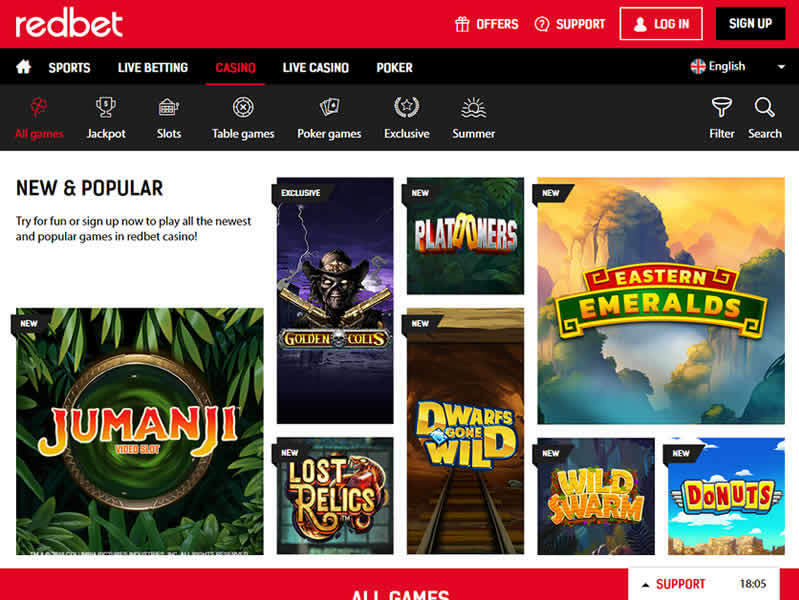 Redbet has really done a great job of providing a safe place to play, an easy to navigate environment, and a great variety of games. It’s hard to imagine anyone playing at this casino and not having a great time. But there is a downside: Redbet has many restricted countries that aren’t allowed to play here. Please check their terms and conditions for more information. Online Casino, Live dealer and Sportsbook. Bet on everything! Amazing game library, more than 1,700 games! Multiple contact methods, reliable support. Reputable group. Best licensing and Audited by SKL. No USA / AUSSIE players. Many restricted countries. Check T&Cs for more info.